Windows updates are an important part of any user’s experience when using Windows 7. Microsoft releases periodic updates that serve to increase security, fix bugs and offer updated features to those using them. These updates are easy to install and essential to keeping your operating system in working order. 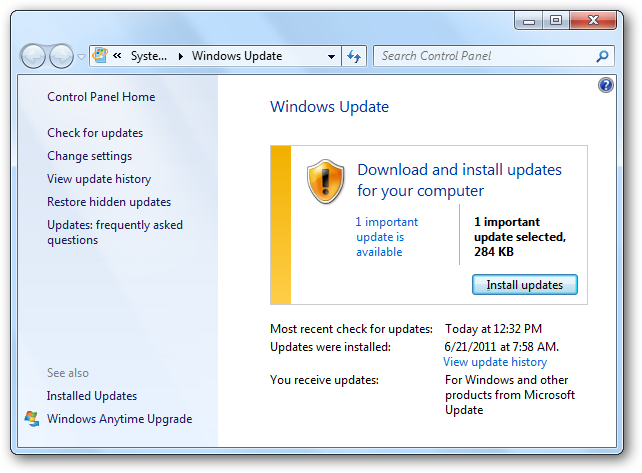 Many users do not set up updates for Windows 7 nor do they pay attention to what is going on when these updates occur. One of the first things you should learn how to do when using Windows 7 is how to set up updates. 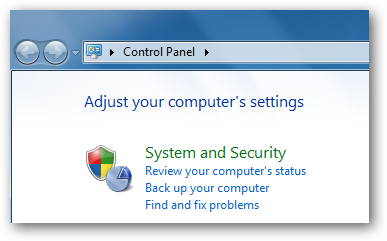 In order to set up Windows 7 updates, you must navigate to where the settings are stored on your computer. 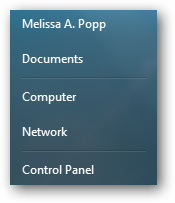 You want to click on your Start Menu, then the “Control Panel” on the right-hand pane. Once your Control Panel is loaded, you want to click the “System and Security” header. This will lead you to a variety of options for your system’s security. You want to find the “Windows Update” header. You are given three options to work with under this header: Turn automatic updating on and off, check for updates and view installed updates. Once your updates are set up the way you want, these are the three most common options you may want to check out down the line. “Turn automatic updating on or off” allows you to manually update Windows 7. This means you would have to click the “Windows Update” option in your “Start Menu” to begin the process. Windows Update will display what current updates are available, allow you to download them and install them on your own time. “Check for updates” allows you to search for new updates to Windows 7, Microsoft Office and other Microsoft services on your computer manually. “View installed updates” lets you see what updates have already been installed, what build they are and when they were installed. This information can be important if you need to restore your computer to a particular system restore point. This will take you to the Windows Update main screen. You will be able to navigate through various settings in the left pane of the panel. As you can see, I currently have one Windows Update that needs to take place on my own computer. That process will be covered in an upcoming post. Click on “Change Settings” in the left hand pane. Here you will set up the major settings for your Windows updates. Ideally, you should set up automatic updates for Windows 7. This will allow Windows Update to download new updates on its own and then you can approve when to install them during the day. This is less time-consuming than finding, downloading and installing updates manually. 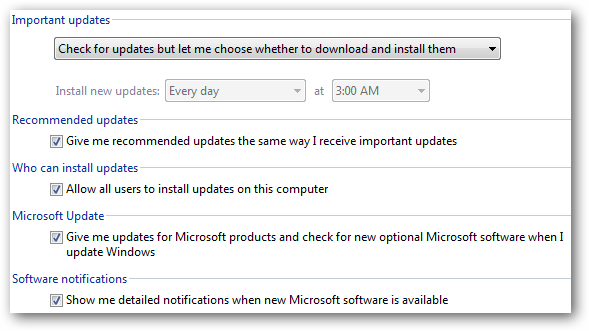 The first option, “Important updates,” is where you set up automatic or manual updates. You can even choose what time of the day to automatically install updates so you avoid doing them while you are on your computer. There are several types of updates that occur in Windows. You can have important ones that are required to ensure security and stability of your system and you can have recommended updates. Recommended updates do not necessarily have to be installed. The “Recommended updates” section is where you decide if you want these updates to show up the same way more important ones do. You really should allow recommended updates to show up with important ones and then decide on a case by case basis if you want to install them. You may miss out on an important update to a Microsoft-based program or service you use regularly otherwise. “Who can install updates” gives the administrator of the computer the option to install updates themselves or let anybody who logs on when an update goes live to go ahead and install it. If you are worried someone might install an update you do not want, uncheck this box and handle Windows 7 updates yourself. “Microsoft Update” allows you to opt into recommended services for the operating system you may or may not be using. This is where important updates to Office, Windows Live Messenger and more may pop up. If you use any other type of Microsoft software, you want to keep it updated, too. While each program will offer the option to check for upgrades, most are integrated into Windows Update now so this will be the easiest way to stay up to date. “Software notifications” will give you alerts when new Microsoft titles are available for free download. If you are interested in trying out now software for Windows 7, keeping this box checked will opt you into those downloads when available. 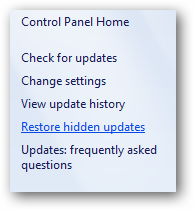 Next, you want to navigate to “Restore hidden updates” in the left window pane. 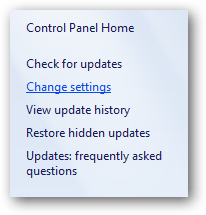 You can opt to hide certain updates if you do not want to install them. While this gives you the option to keep these updates from prompting you to install them, sometimes these updates can be marked to be ignored by accident when you really need to install them. Checking your hidden updates every so often is a good way to avoid missing out an important update. Now that you have set up your Windows Updates, you want to restart your computer. Conclusion – Why are Windows 7 updates important? Windows 7 updates are important to keep your computer running to the best of its capacity. Microsoft releases a variety of updates that include security patches, new service packs and fixes that eliminate bugs and other issues that occur within the operating system. If you are not updating Windows 7 when necessary, you could have issues down the line with problems that pop up that those updates would have fixed. While Microsoft does not release updates every day, it is important to check out every update released to make sure your copy of Windows 7 is working properly.